In photography, you can have such a problem when your images are uploaded with a different color profile. Most browsers and photo viewers rely on the "fact" your image is saved with an sRGB embedded profile. I had a similar issue with video. I'm using Mac OS X as my operating system. My currently preferred browser is Firefox, but I sometimes use Chrome. 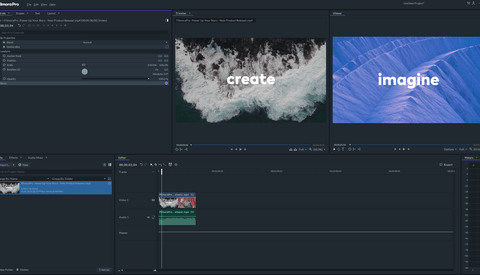 For video editing, I'm currently using HitFilm, where I do all the cutting, compositing, and color grading. When I export the edited footage, I go into Finder and press the space bar to review the result, and then, I upload it on YouTube with Google Chrome. Most of the time, I use an H.264 codec and an sRGB color profile. The problem is quite noticeable when you have to match skin tones. On the left is the quick preview. In the middle is the video editor. On the right is a screenshot from Google Chrome. What was my first thought? It was a problem with the editor. For me, it was unacceptable to color grade by eye without any waveforms monitoring and export to see if it was correct. This would be quite inaccurate and very time-consuming. At that time, I tried editing with DaVinci Resolve, but I had the same problem. I did a test in Avid Media Composer. The same. The exported video looked bad: no contrast, lack of saturation, wrong colors, especially if I was working with skin tones. Then, I tried a different video player. The default one was Quick Time. I installed VLC and voila! The video looked the same as in my editor. I tried viewing the uploaded video in Firefox instead of in Google Chrome. There it had the correct contrast and colors. The problem with the video review turned out to be in the QuickTime ecosystem, which seems to be notorious for its funky color management. To my understanding, it mixed the color profile with the color profile of the calibrated monitor, which has a wider gamut than sRGB and thus created a strange combination that was utterly unacceptable. Unfortunately, the quick video preview in Finder uses QuickTime for rendering the video and always shows it badly. That's true for stills too. This can happen for those of you who use QuickTime on Windows and have a calibrated monitor. What about the uploaded video on YouTube? Chrome was having the same problem: low saturation and contrast of all uploaded videos. Fortunately, I found a workaround by turning off any hardware graphics acceleration from the browser settings. Turning off Google Chorme's hardware acceleration works around the problem with low contrast and desaturated videos. It's good to have confidence in the video applications you are using. After all, you use them as tools to process your video footage. Always keep in mind those pieces of software can have flaws no matter how mature they seem. Has anyone experienced such problems before? Did you find a different solution? FStoppers should institute a prize for anyone who makes sense of this post! Try the same environment and you'll understand it. If you're with a different operating system and you never use QuickTime or Google Chrome with a hardware acceleration turned on, you probably won't experience this issue... and this article won't make any sense to you. 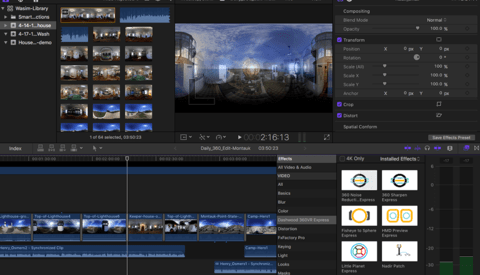 Easy to understand if you have experienced the same problem :-) I tried out the new Davinci Resolve (free version) last week and dumped my previous video editor the next day. The Resolve export and subsequent Youtube footage looked better to me in any browser or video player. What about the QuickTime player? Anything that is viewed in it looks desaturated, including the photos that are viewed with OS X's "Preview" application. And yes, even if the photos are having the sRGB profile embedded. BTW, DaVinci Resolve has a setting for OS X that makes the footage look like in QuickTime while you're editing it. It's in the preferences > System > Hardware Configuration > Use Mac Display Color Profiles For Viewers. You just made my day with the Davinci Resolve trick. Thanks for the tip. The guy that created DisplayCAL recommends not using the setting but instead generating a LUT to use for the viewer (https://hub.displaycal.net/forums/topic/color-differences-between-refere...). See my post on this thread for more details. What is the Resolve “trick”? Lou Bragg, read the two-paragraph comment of mine above starting with "What about..."
I’m just curious, did you really experience the same issue as the poster? Can you elaborate? If you're on a Mac OS X, simply create a green rectangle (e.g. #108e13), save it as a PNG, open it in Preview and in Photoshop, create a screenshot of them both on the same display and then open the screenshot in Photoshop. With the eyedropper compare the colors and see that the green in the "Preview" is not the same green you created in Photoshop. You can do the same for video. I know, but why these software corporations chose a different approach to color management? When you print something processed in Photoshop on a color calibrated monitor and your printer is profiled correctly, you get the same result. No desaturated colors, no color contrast. Why Apple made those decisions? Why Google did that too? As far as I know on calibrated displays on Windows there's no issue unless you use the QuickTime ecosystem. Color management is actually a very complex subject. And each software may have a different way of treating it iiinside its pipeline. The standards work for the most part but it’s not an ideal environment. I had this issue and found a way to work with it using DisplayCal and a color calibration tool to generate a viewer LUT to use in Resolve for color work. I still find it all a bit mysterious, but if you follow the process in this article (https://hub.displaycal.net/wiki/3d-lut-creation-workflow-for-resolve/#cr...) and apply the generated LUT in the Resolve preferences to affect the playback inside resolve, then when you watch the exported video in Chrome or Quicktime it looks exactly the same. You can also apply it in Premiere on adjustment layer for doing color work and then remove it before exporting. In Firefox, the video then looks more saturated. But way more people use Chrome than Firefox so I'd rather get it right in Chrome. 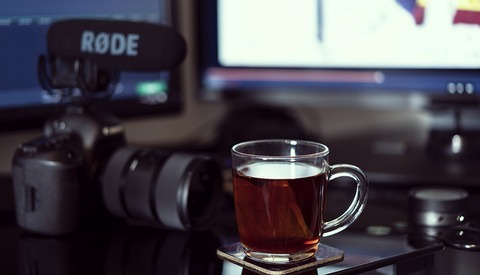 There's another article which touches on the issue (https://hub.displaycal.net/forums/topic/settings-for-video-editing/). This is more of a patch. I don't think changing your footage so it looks fine in some viewers is the right approach. 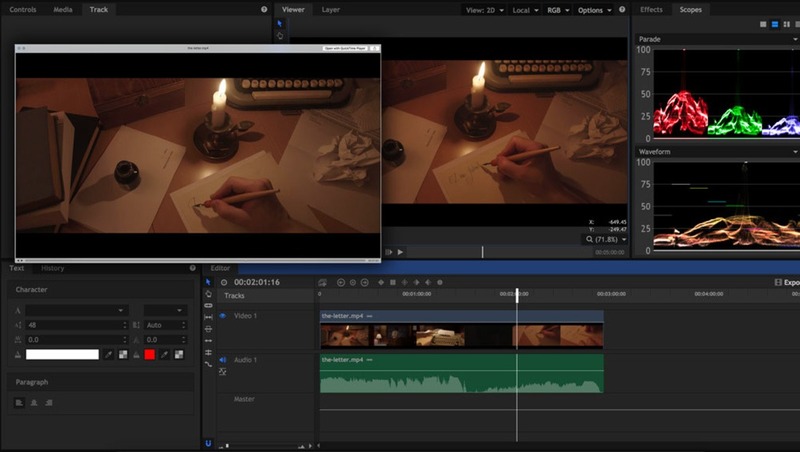 For example the footage looks the same in Avid Media Composer. It's a professional software after all. The same for DaVinci Resolve without any LUT or Color Management hacks. The difference in the saturation is small to the general public eye when the colors are correct in the editor. I better have a slightly desaturated and low contrast footage in Chrome and QuickTime than correctly looking there and oversaturated in all other browsers and players. YouTube ALWAYS recompressed video into its own native codec regardless of the upload format. Did you know you can upload ProRes files (in any flavour) to YouTube, rather than mp4 files? I always do this for my showreel work and the results are much cleaner than mp4. Even the lower quality ProResLT format will provide much better results. Hi, I still have this problem when I upload video on youtube. All my black turned grey and all my color is desaturated. I read a lot about this problems and I try every solution that I find but nothing works. I turn off ''hardware acceleration'', somebody else say tried to export via another browser like FireFox so I try to upload video from Safari and FireFox and I still have this problem. Right now the only solution that I find is a LUT that over saturated so when I upload on youtube the color is little bit better. I'm very frustrated because I don't know and I don't understand what is the problem... Some people tells me that it's impossbile to fix this. I don't know if somebody can help me ! I'm using Premiere Pro, I export in H264 and I have a Imac. The video on YouTube always looks a bit desaturated indeed (not as much as in Chrome or Safari or in Preview or in QuickTime), but keep in mind it's the same with Hollywood movie clips too. Also blacks are almost all the time above zero in any professional movie. Maybe if there's a pitch-black night you will have zeroes for the blacks. Make sure you use waveform and vectorscope when you color grade your video, because it may be more desaturated than it should. Of course, saturation is subjective and it depends on the project. Yes I use waveform to make sure I have information in black and white ! So my only option is over saturated in post production to make sure when I upload on youtube the color look ok? Because the thing that I don't understand is I follow some people on youtube they make video with DSRL 8bit etc... and their color is very clean the black is black and they I don't see any desaturation all the color look good and like I said when I put the ''correction LUT'' at the end of my color grading my black look good on youtube they don't look washed out. I'm just tired that I can't fixed that and some people didn't have this problem. By the way thank you for your help I really appreciate ! I don't say "oversaturated" is the way to go. Can you check how it looks on a Windows computer? I feel your pain. I have the same issue, but I have also found many people who do the "DSLR-look" thing use overly-saturated and overly-contrast final videos. Many of their screens are not calibrated. But again, check on a Windows computer and then make your decisions. I have delivered my videos to companies that play them on their company screens that are Android or Windows based and the videos look saturated and with a nice contrast (even a bit more because of the non-calibrated screens). In my case I just make it look good on my computer in my editor and in VLC and I deliver the final product. I surely check it on a mobile device and on YouTube/Vimeo, but I don't make many changes after that. Haven't had issues. Perfect thank you for helping me ! !